I am a big fan of graffiti, but since I have no painting skills I have nothing to offer the graffiti community other than my photographs. I have a few friends who bomb, but we gotta keep them a secret. I just wish I got pix of the wall of fame before they covered it. 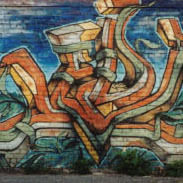 I don't know enough about graffiti to talk about the pictures, so I will let the art speak for its self. Click to enlarge.